Very adaptable plant that is easy to grow. 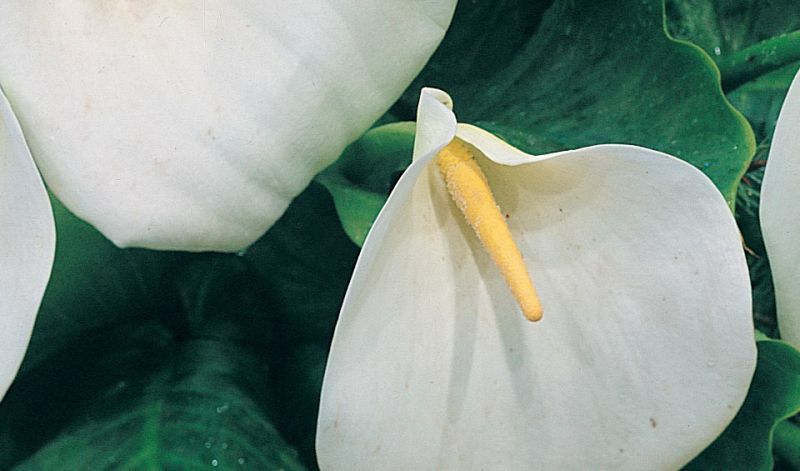 The largest of the calla lilies with flowers up to 8" / 20 cm long. A florist's favourite. It prefers moist, fairly boggy conditions and grows well besides ponds and water features. It can even be grown as a marginal plant in up to 12" / 30 cm of water. Beautiful deep green arrow-shaped foliage that can grow up to 10" / 25 cm wide and 18" / 45 cm long. A magnificent landscape plant and splendid as a cut flower. In milder climates (it can survive periods of minor frosts) where rainfall is adequate it is an evergreen, deciduous when there is a dry season. In flower and perennial beds, water gardens, pots & containers and as cutflowers. (Besides the species itself); 'Green Goddess' (mottled green and white) and 'Pink Mist' (white and soft pink).